If you're thinking about how to start a cucumber farm, then you're definitely in the right place. Make sure you read this article till the end because in it lies your success and motivation in cucumber farming. The importance of agriculture in Nigeria can not be overemphasized. Many persons are profitably engaged in agriculture, you should too. Cucumber farming in Nigeria is not as complex as other areas of agriculture, so you can start small with relatively little or no experience. Just read the following essential steps I put together to help you succeed. Follow it to the best of your ability, and don’t delay, start your cucumber farm today! Procrastination breeds poverty. As the name implies, a feasibility study is an analysis of the viability of a business idea. The feasibility study focuses on helping answer the essential question of “should we proceed with the proposed project idea?” All activities of the study are directed toward helping answer this question. Farmers with a business idea should conduct a feasibility study to determine the viability of their idea before proceeding with the development of a business. Determining early that a business idea will not work saves time, money and heartache later. A feasible business venture is one where the business will generate adequate cash-flow and profits, withstand the risks it will encounter, remain viable in the long-term and meet your goals of establishing it. Before you start your cucumber farming venture, a thorough background search and a study to determine its feasibility in the area you wish to establish it is important, and the same is true for any kind of vegetable farming in Nigeria as well. 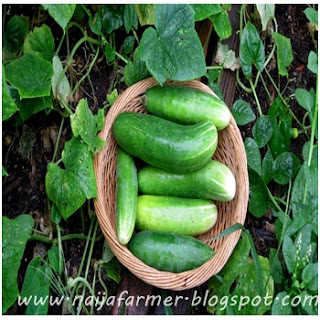 There are several breeds/varieties of cucumber that are specific and thrive best in a specific regions. 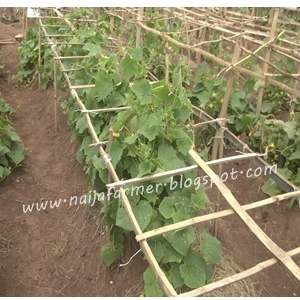 Thus, before you start cucumber farming in Nigeria, you need to gather all of the necessary information in order to setup your farm at the right location, right time and the right cost. A business plan is what you need to run your farm in an organised and structured manner. The business plan provides a 'planning function'. The business plan outlines the actions needed to take the proposal from “idea” to “reality. Also, if you do not have all the capital required to start your cucumber farm, then with a solid and defined business plan, you will be in a better position to attract bank loans, private investors, or even government grants that are becoming widely available. Cucumber can be grown in wide varieties of soils from sandy loams to clay soil with good drainage. Make sure the soil contains organic matter by adding organic compost or any farm yard manure for higher yields. Soil PH should be between 5.5 and 6.7 is favourable for optimum growth. You can ask your an Agric. Consultant to help you determine whether you have the right soils. Cucumber needs enough water for best performance. 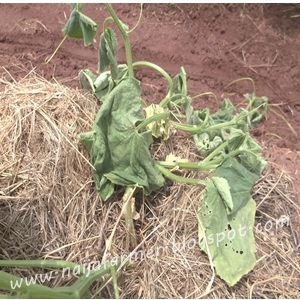 Starting your commercial cucumber farming in an area with low rainfall without irrigation, will lead to a huge loss. 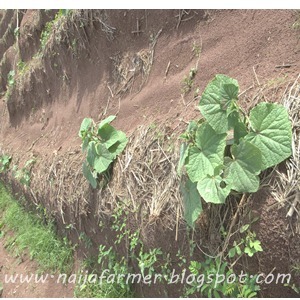 Once you have secured a good land, you will need to prepare it before you begin the planting of the cucumber seeds. Clear all weed and grass in the land. Make long ridges at about 1.5 meter apart. Apply oganic manure on the ridges. Apply compost manure like poultry, pig or cow droppings on the beds or ridges before planting. Cucumbers do well in a humus-rich soil. Treat the cucumber seeds with Pseudomonas fluorescens 10grams or Trichoderma viride 4grams or carbendazim 2grams per kilogram of seeds before sowing. Note: Pseudomonas fluorescens suppress plant diseases by production of number of secondary metabolites including antibiotics, siderophores and hydrogen cyanide. This microbe has the unique ability to enter the plant vascular system, reach the various parts of the plant system and act as a systemic bio-control agent against various fungal and bacterial diseases. Competitive exclusion of pathogens as the result of rapid colonization of the rhizosphere by pseudomonas fluorescens may also be an important factor in disease control. This is called biological control of pests and diseases. is a widely used, broad-spectrum benzimidazole fungicide. Carbendazim is a chemical seed treatment, while Pseudomonas fluorescence and Trichoderma viride are biological seed treatments. Note: Seeds bought from seed companies are usually treated. You can check on the label or ask the dealer if the seed has been treated. Planting of cucumber seeds on the row(beds or ridges) should be done at about 90cm apart. I used 90cm for my own cucumber farm and it worked fine. Alreday the rows should be about 1-1.5m apart. You can use 1m if you want to manage space. Make holes of about 2.5cm deep at 90cm apart and sow 2-3 seeds of cucumber. Apply organic manure again after 30days to the root of the plant. If you're not an organic farmer, you can use inorganic NPK fertilizer. 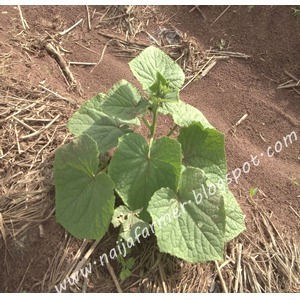 Weeding can be done during early stages of cucumber plant growth to control weeds. Herbicides may be used for controlling the weeds. Stake the cucumber plant. This is necessary to prevent the cucumber touchin the soil and also help the plant get much sunlight. 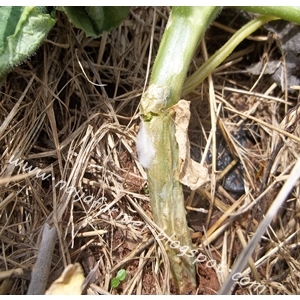 The main disease in cucumber farming is Downy mildew and it can be controlled by applying Mancozeb or Chlorothalonil 2g/lit twice at 12 days interval. Over 80% of cucumber composition is water, so the need for constant water is key. 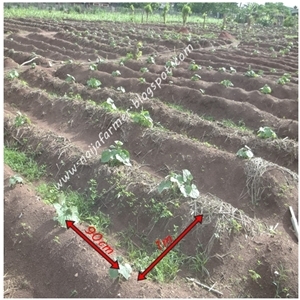 Securing suitable land and a constant water supply are the most important parts of a successful cucumber farming venture. Your constant source of water could be a nearby stream or to sink aborehole in the land. If you don’t have a constant source of water, your cucumber farm may not even survive past the first harvest if rainfall is not adequate. If water is evenly and constantly supplied either as rainfall or irrigation, the primary effect is that the cucumber will taste bitter. Have you ever eaten bitter cucumber before? Let’s just say it’s not very nice, even animals will refuse to eat it. The end result will be that nobody will buy your cucumbers and you can wave goodbye to your profits. 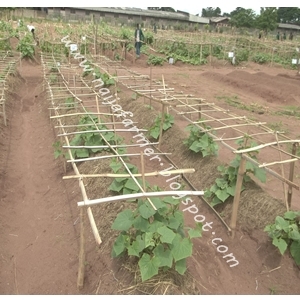 Drip irrigation is the most effective method of irrigation for cucumber farming. It utilizes water efficiently while ensuring that water is supplied directly to the plant roots. Crop irrigation should be given to maintain moisture at all time especially during dry season. If you don't have enough money for drip irrigation, you can use a hose connected to a water source to water the soil close to the roots of the plant. Try as much as possible not to pour water on the leaves. Excess moistures festers fungi invasion. This manual method of watering cucumber using hose or watering can is not profitable as it consumes too much water and hence cost of fuel increases. This method is also stressful and labour consuming- you end up paying workers to water the farm. This method should not be relied on during the dry season or for large scale farming. The time of first harvest is around 40 to 60 days after they have been sowed. Harvest time might be influenced by factors such as seed variety planted, flowering time, climate and even moisture. On an average 8 to 10 harvest can be done on one cucumber farm. Timely picking of cucumber is very important for better quality of fruit. Cucumbers can yield 8-10 tonnes per hectare depending on seed variety planted. Share and like this Post. Don't forget to comment. Don't procrastinate you can start cucumber farming right now.